A little known fact about me as that I have a small addiction to Facebook gaming. I keep it under wraps by changing the privacy on any game posts to only be seen by fellow gamer friends. So that means that the rest of my family and friends don't see those game updates and therefor don't think I am as crazy as I really am. If I didn't do that, all they would see on my feed is Farmville posts. And a lot of them. I was recently introduced to a new game from ToonUps called A Better World. For more than ten years ToonUps has worked to create digital content that promotes social consciousness. Gameplay activities are designed to help everyone who participates feel better about themselves, be supportive of others and make positive choices in their everyday lives. 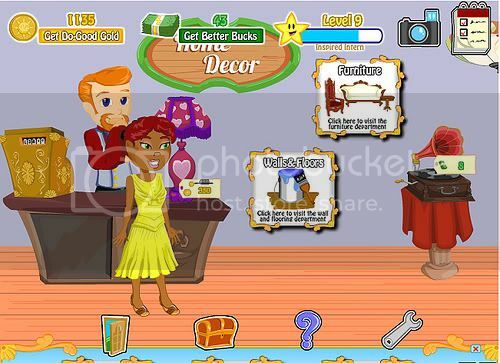 Players also can play mini games with inspirational themes; have fun shopping; and personalize their characters and virtual spaces. As with most social media games, players start off by customizing their avatar. To earn some shopping money and move up through the levels of the game you can then explore the more than 15 locations with the community. Two of my favorite places to visit are the Arcade where you can play minigames and the Gratitude Grotto where you reveal what you are thankful for. In the Arcade I like to play the ThreeCycle game. It is similar to Bejeweled in that you have to match 3 like items in a row, in this case 3 of the same recyclable item. But you also have to remove the trash from the grid. Or you can stroll over to the Sanctuary of Hope where you can share your hopes and dreams with the rest of the players. This game is all about being rewarded for good deeds and there are plenty for you to perform in order to move up. You can plant a garden, visit a friend's house or send a friend a cute heart. There is also a Daily Mission and if you complete all of the tasks on the list, like maybe helping someone find their lost glasses, then you get some bonus rewards. One thing that I enjoy about these types of games is that once I have earned up enough virtual money, I can go shopping! I spend most of my time in the home/furniture stores. In A Better World you can buy wall and floor colors, furniture and accessories all in the Home Decor store. If you are looking for something a little more unique you can head over to the Emporium. Now that you have spent all of your hard earned money on furniture and knick knacks, it is time to head home and decorate. I LOVE this part. There is just something about decorating that it so fun for me. It is pretty easy to move your furniture and other items around in this game to perfect the look you want. Overall this is a fun game to play. There are definitely plenty of different things to do and keep you busy. What is really nice is that so far there are none of those annoying "get 10 of your neighbors to click on this " posts going out on your feed. Those start to drive me crazy after a while. It is great to just be able to play a game and not get stuck on something because you don't have enough neighbors yet. If you like games like YoVille and Farmville then this is definitely a game you will want to check out. I was given the opportunity to share my thoughts and opinions on A Better World. I received a gift card as a thank you for my participation. All thoughts and opinions are my own.